Awesome baking abilities run in the family and Amara is inheriting them. I remember what a wonderful cook my Grandma was and I like to think that I take after her. My real mother did not cook but my step-Mom Donna has won ribbons at the County Fair for the cakes she has decorated. I can remember Jenna sitting in her high chair holding her finger out hoping that Grandma Donna would squirt frosting on it as she frosted tall, elegant wedding cakes. She always did! I have always loved to cook and bake but Jenna is truly amazing! She even has her own cooking blog. 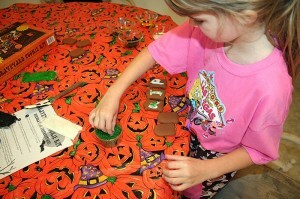 Today she was working on 3 cakes at once for the upcoming Cake Walk at Amara’s school. Amara was almost 5 when she first tried her hand at cake decorating. 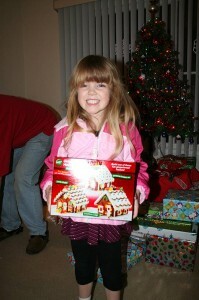 Her Aunt Sandy sent her (and me) a Wilton Gingerbread House for Christmas. Amara was so excited and so we planned to spend a Saturday afternoon working on it together. I did the assembly and let me tell you – that was the hardest part! One of the back pieces was cracked and had to be frosting glued back together and trying to get it all to balance was quite a task. 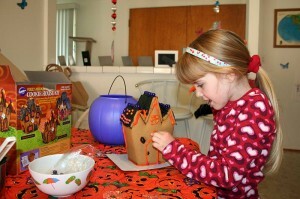 She was patient while I glued all the pieces together and like her Mommy frequently held out her finger to be decorated. The over-sized apron she is wearing is one that Grandma Donna made for me. She loves the skirt on it and it almost touches the floor on her. Once I got it all put together Amara did a great job of covering it all with frosting. I was really impressed! You could tell she had watched Mommy. Then she did all of the decorating herself! She looked at the pictures on the box but she had her own idea about how it should look. This was the first of many decorating projects Amara and I have done and will do over the years ahead. Our next project came 4 months later when we created an Easter Bunny Hutch. This one was much easier as it came assembled in the box so Amara could get right to the fun part – decorating and licking frosting off her fingers! 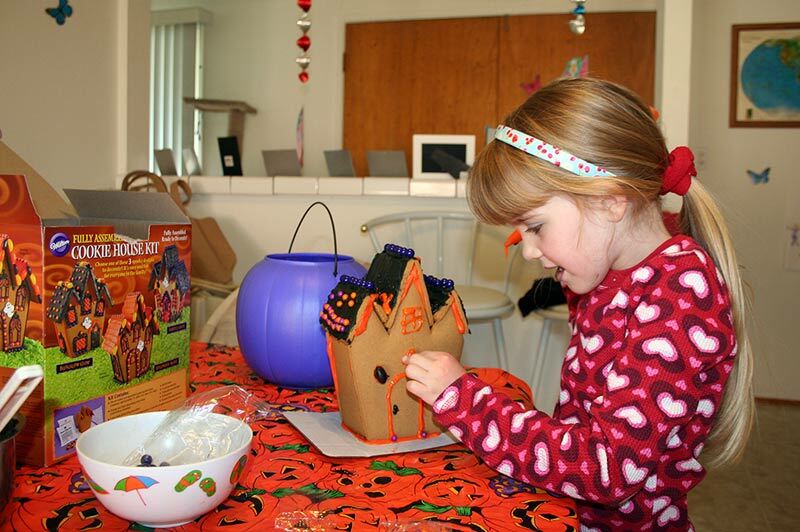 Halloween that year meant decorating a Haunted House. It had lots of orange and black frosting – you can see the black frosting on Amara’s lips! She had such a good sugar rush going by the time Mommy and Daddy came to get her. 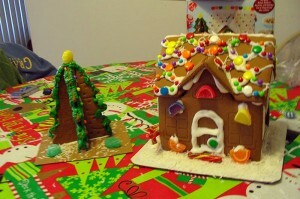 Next up was another Christmas Gingerbread House. It came assembled but it also came with a Christmas Tree that was not! You had to break the cookies in to 2 pieces and then frost/glue the 4 pieces together and make it all stand up on its little base! I managed to get it put together and our girl had a blast making it all beautiful! So did Grandma. When Halloween rolled around this year I was keeping my eyes out for something we could do, we hadn’t done one since Christmas! All of the haunted houses I found were un-assembled, you know how I feel about that. I’ve become spoiled! So when I found this Cookie Graveyard it seemed like a great idea. 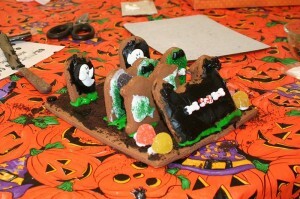 It was a lot of fun but we kept having trouble with the tombstones falling over. I told Amara it was just like in a regular graveyard! I’m not she understood my logic but her Mom did! There was also no way you could write RIP on one of those grave markers unless you put the frosting in a regular decorator’s bag with a very small tip – which of course I did not have! But we made the best of it and we both had a great time! This Grandma thing sure is a lot of fun! 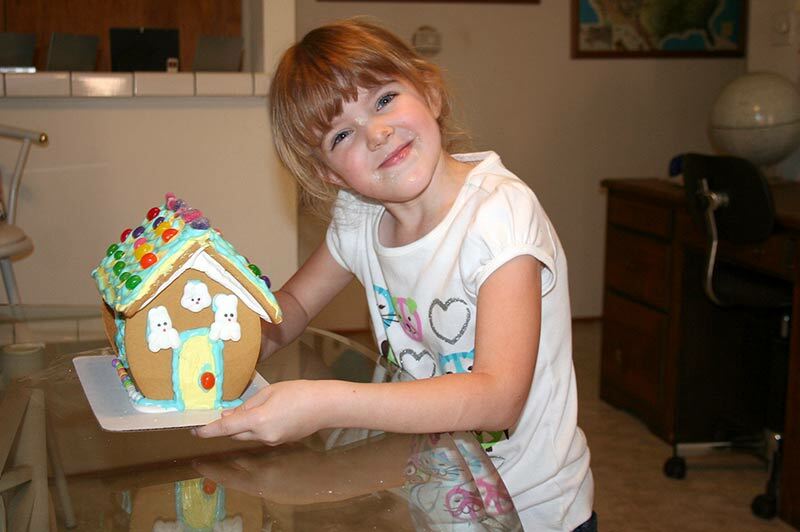 This memory was posted in Indoor Fun, Parent, Previously on Amara, Special Occasions and tagged Amara, baking, cake decorating, Christmas, frosting, Grandma, graveyard, Mommy, sugar rush, tombstones, Wilton on October 18, 2010 by Grandma Kc. Oh wow, does this blog bring back memories … of Mom decorating wedding cakes (mine included!!) 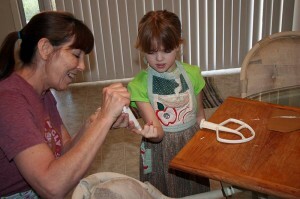 I remember her making that apron for you!!! And Jenna in her highchair waiting for frosting. 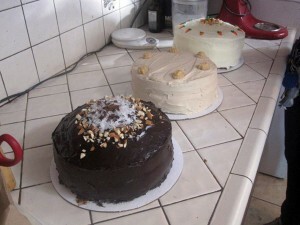 Boy, Amara is going to be the hit of school with those great looking cakes for the Cake Walk. 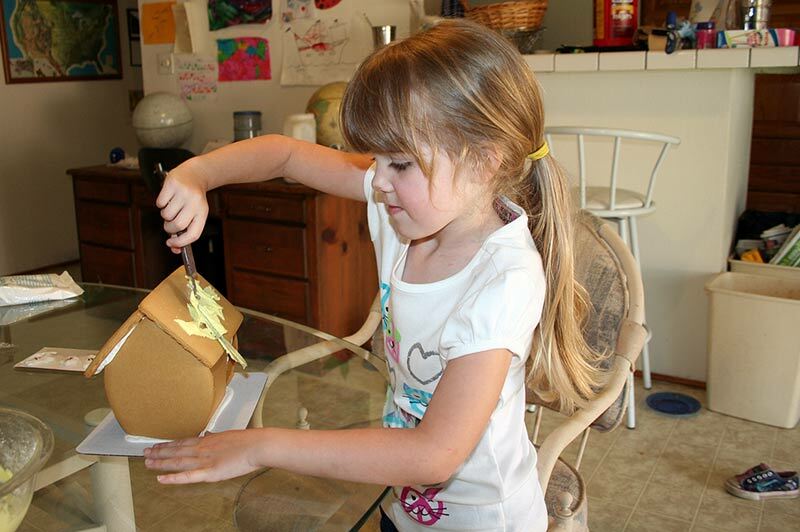 She is getting lots of practice with the gingerbread houses. I am not a good baker.. except for my pie, which I gave up years ago. Am just too busy. Kenz is turning eight in Nov. Her mom says she is going to make the cake. What da’ She doesn’t bake! She doesn’t have a cake pan or a mixer. And she’s saying the word scratch. 22 kids and a cake that might not make it. I’m going to suggest cupcakes. I will even buy the tins and the MIX. I think it’s great you can bake, Some of us think we can.. or might like to try anyway. Maybe when there is NO ocassion. I can’t wait to read about the birthday party next month! 22 eight year olds!!!! That’s just crazy talk. Thanks for visiting. I stop by your blog often and really enjoy it. These look like fun, delicious times! THOUGH I was out doing some weeding in the front not too long ago and a neighbor was negotiating a new freezer into his house. I saw a “GOLD MINE ” and claimed the freezer box for Brent and stashed it in the cellar once they gave it to me. BUT..I am probably just going to tape it back together and cut a hole in it for a window. Thinking of being more creative than that is just exhausting! 🙂 MY HAT is off you crafters / super bakers / and creative creators! Such a fun post with great photos! 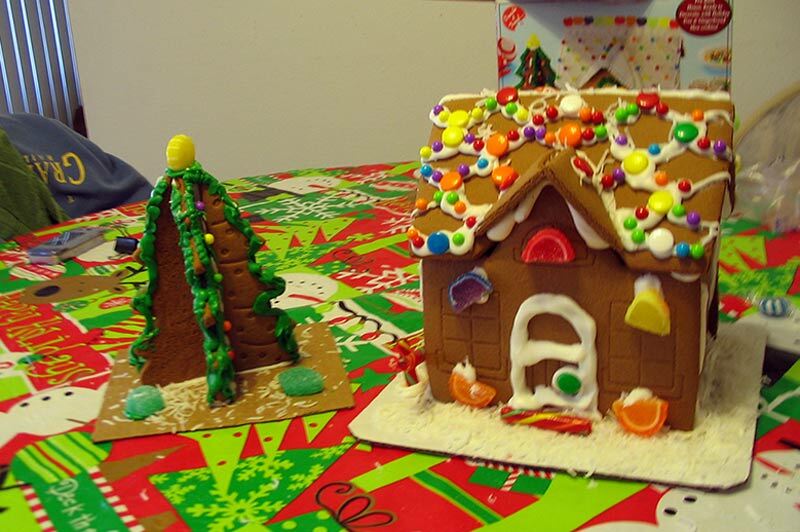 I’ve not yet attempted gingerbread houses with the grandsons. 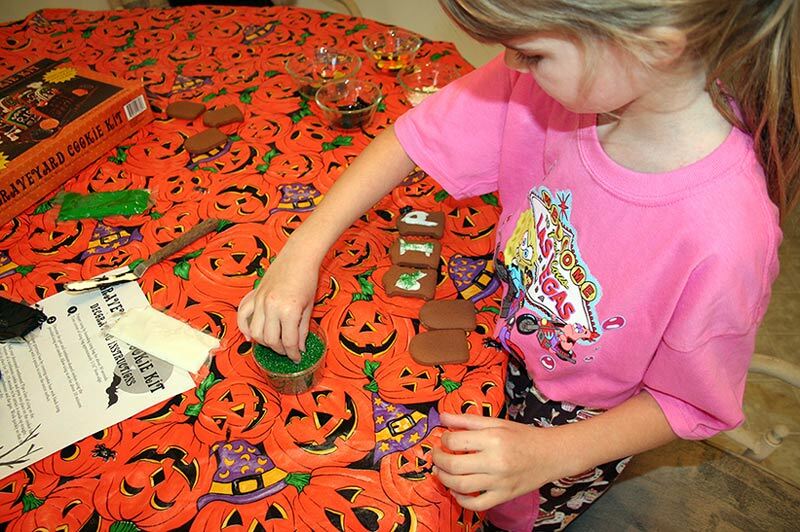 We *did* used to do it with the girls but we used graham crackers to build the houses. I actually even did a “morale building” event with my writers one year during Christmas when I was still an editor. Great time. 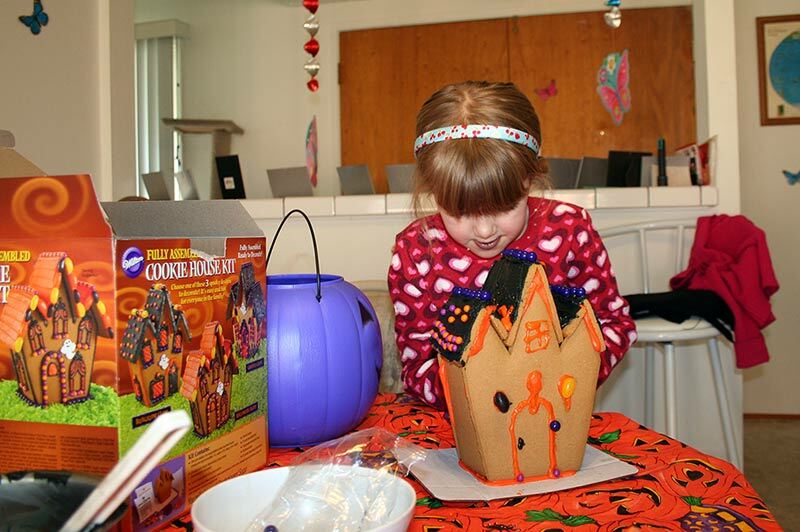 Baking and decorating is such a bonding experience, as you surely know from doing so with Amara and Jenna. PS: Thanks for the link to Jenna’s blog. It is indeed awesome (and making me hungry!). Our oldest little princess loves to help in the kitchen. 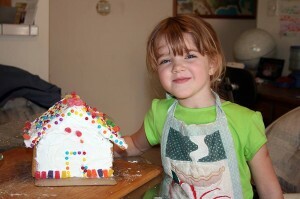 At 2 years old she was already helping decorate cookies and cupcakes. I think she may be old enough to do a gingerbread house either this year or next. I’ve never done one myself. These look like so much fun. What a face!!! I love that face.